I've been serving in the United States Army for 8 years. I come from a very patriotic family. My father currently has served and continues to serve 19 years of service with the Army providing maintenance and logistical support to Combat Arms Soldiers. I have a younger brother who is also serving. We take pride as a family in what we do to serve the sons and daughters of America. On my free time, there's nothing I would rather do than to spend it with my 8 month old daughter. I am currently a single mother in command. She is the reason for which I continue to live a blessed and happy life despite the challenges and obstacles presented to us as a pair. My time with her is precious so often times our days are filled with hide-and-seek, song, and identifying textures, shapes, and the world around her. I also love to travel when the opportunity presents itself. The biggest driving force was the desire to give back to the organization that gave my family life. When my Dad joined the Army, we were open to a world of new opportunities. One of those opportunities was the ability to send me school and financially supporting me through 5 years of my undergraduate studies allowing me to walk away debt free from college. Of course came the sacrifices - of which my Dad served 3 combat tours during my college years. My parents have requested for nothing back and that was the biggest shaping moment which influenced my decision to the join the military - to give back to the organization that gave my family opportunity. My favorite memory by far is being reunited with my Dad in Baghdad, Iraq where he was able to join me for a promotion ceremony at our Division Headquarters, pin on my 1LT rank, and to see how proud he was at that very moment. Without a doubt, I serve the country that gave me opportunity - plenty of them. As I've recently become a new mother, I also serve for my daughter; and I also serve to standby my Father and brother which has been an absolute honor. I love being a leader of Soldiers. I absolutely love being an advocate for their careers and provide genuine care. 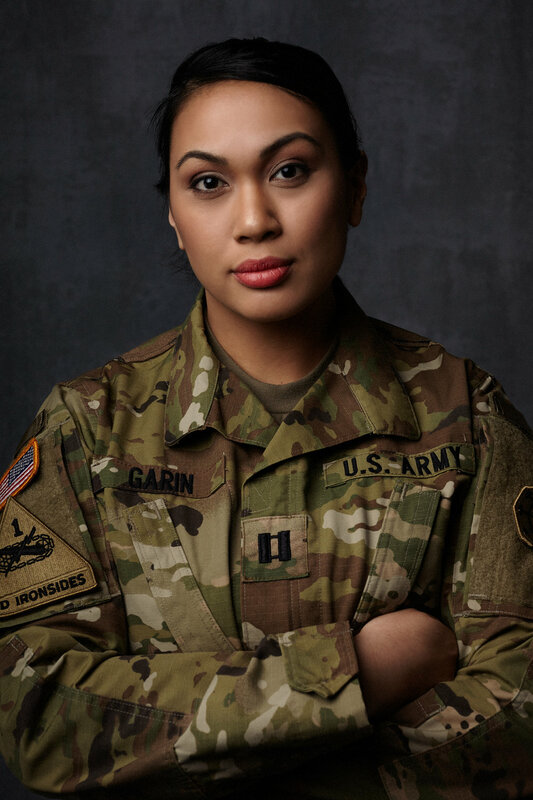 But where I want my legacy to remain and for me to be remembered is the example I set for all women who strive to exercise balance in a life of chaos in the military. This is by no means something that I have down. I have a lot of things to learn. And a lot more I have to endure. During my career, one of the hardest things for me to do was to take my formation of Soldiers, stand before them, and assume command as a single female officer who was 17 weeks pregnant. A rarity on its own, I had to prove to my superiors, peers, and subordinates that I would in no way fail them because I was a woman or that I was about to be a single mother. I also accepted judgement from superiors outside of my command, but knew that my strength, willpower, determination and art of balance would one day break the barriers of stereotypes, unspoken rules, and inspire others to continue to prove the strength, willpower, and determination of women in our profession of arms.